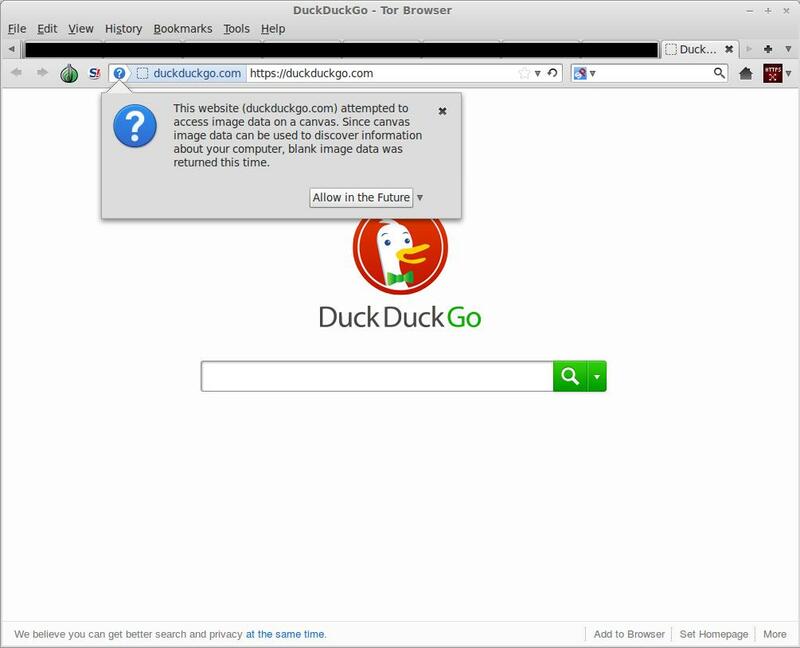 This website (duckduckgo.com) attempted to access image data on a canvas. Since canvas image data can be used to discover information about your computer, blank image data was returned this time. I don&apos;t know anything about this subject matter myself so could someone explain to me what information duckduckgo.com is trying to get and why this is useful? Probably a small glitch on our side--we&apos;ll investigate asap! At first glance and after having a brief internal talk this looks to be the result of anti-alias detection upon initialization. It also bleeds into the SERP pages. I&apos;ll investigate a bit. This is a warning issued by TorButton which is an extension not a part of the proxy. Thanks!---I see it as well. We&apos;ll take a look. Just an update to this--we&apos;re still looking into a fix but it&apos;s a problem with font detection. There aren&apos;t any security implications, as it&apos;s only an issue on our end. It is adjusting the fonts. Use https://duckduckgo.com/lite or https://duckduckgo.com/html if you&apos;re scared. 11 monthes and still nothing, no one cares ? The problem with them using this method to "adjust fonts", as shown by recent FISA orders and the takedown of Freedom Hosting and use of exploits for holes in tor browser bundle, is that the govt will stop at nothing to watch what everyone is doing, even violating unlawful search and seizure limitations of the constitution. User gets tor browser bundle and sees the warning. User searches for reasons why. User finds it&apos;s just a "font adjustment" on sites like this and decides to "Allow in the future" this type of activity. Feds issue a FISA order and/or seize the duckduckgo servers and get the canvas snooping changed to start doing fingerprinting of the machine. User&apos;s identity is compromised because he decided to "Allow in the future" the snooping. So much for "Search anonymously". As Zac said, this has to do with our font choice, Segoe UI. Unfortunately it looks terrible on computers without anti-aliasing and so we check the canvas to see if anti-aliasing is on or not. if it is on, we go with the font. If not, it falls back to Arial. We are in the midst of a redesign that should make this issue go away.